Chief seaport in the northwest of England, situated on the Mersey, and in the county of Lancashire. There was a primitive settlement of Jews in the town about 1750, but this later became extinct. Tombstones with Hebrew inscriptions were discovered beneath some structures between Derby street and Cumberland street, an old portion of the city. The synagogue with cemetery attached is marked in a map of Liverpool for 1796; but at the time of Harwood's large survey in 1803 it had disappeared. It became a Sandemanian chapel (W. Robinson, "History of Liverpool," 1810, p. 388). It seems that the first Jewish settlers were mainly recruited from the Portuguese Jews of Bevis Marks, London, and were of those who were about to proceed to Ireland, Dublin being then an established Jewish center. About 1780 the Jews again assembled for worship in Turton Court, on the site of the present customhouse. From their names, as given in a Liverpool directory of 1790, they appear to have been a medley of Germans, Poles, and Londoners, mostly itinerant dealers and venders of old clothes. Here and there a Sephardi is recorded as a merchant; but the Polish element must have predominated, as the early minute-books of the community are written in Judæo-German with square, not cursive, characters. The next removal, in Dec., 1789, was to Frederick street, the Liverpool corporation assigning to the Jews for religious purposes a building with a garden in the rear for a cemetery. At the extreme end of this synagogue, which could hold sixty or seventy worshipers, was a glass roof evidently intended for a sukkah or tabernacle. In the basement was a "miḳweh," or ritual bath. In 1806 the corporation presented the Jews with another site in Seel street, where the Old Hebrew Congregation met from 1807 until 1874, when it removed to the present handsome building on Prince's Boulevard. In 1835 the town had encroached on the cemetery in Oakes street, and a burial-ground was purchased in Fairfield (Deane road), then quite rural; this in turn became inadequate, and a new one in Broad Green was opened in June, 1904. The Seel street synagogue was the first in the United Kingdom in which sermons were delivered in English; this happened in 1806, the preacher being Tobias Goodman. D. W. Marks acted as secretaryand preacher to the congregation in 1833. He subsequently became chief minister of the Berkeley Street (London) Congregation of British Jews. There were probably 250 Jewish families in Liverpool in 1838, when a secession took place in the community. At first the seceders held divine service in a small building in Hardman street, now used as a temperance hall. In 1857 they erected a handsome building in Hope place. They also purchased a cemetery in Green lane, Tuebrook, which is still (1904) in use. 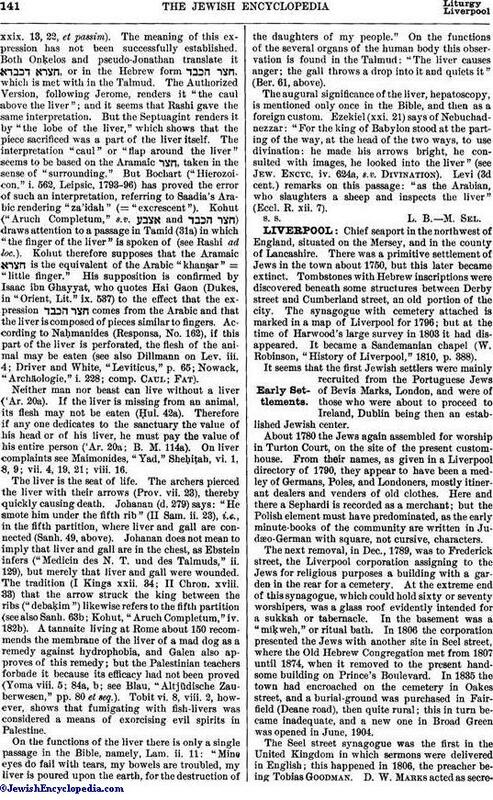 In 1846 a few numbers of a monthly Jewish magazine entitled "Kos Yeshu'ot" appeared in Liverpool. 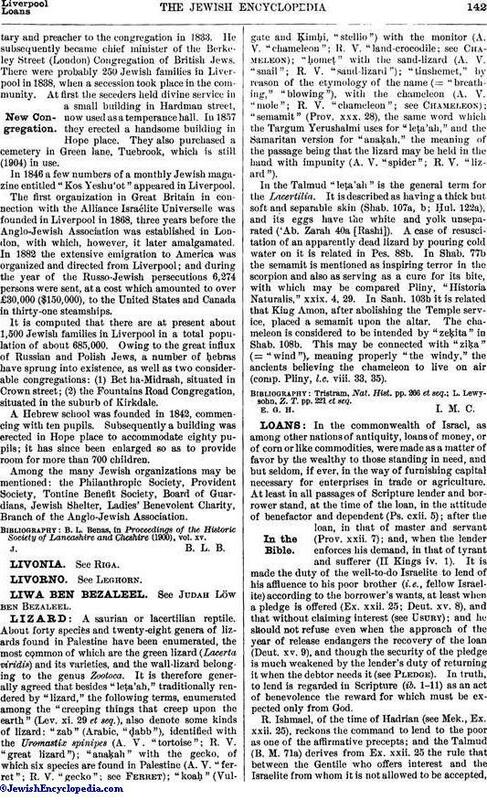 The first organization in Great Britain in connection with the Alliance Israélite Universelle was founded in Liverpool in 1868, three years before the Anglo-Jewish Association was established in London, with which, however, it later amalgamated. In 1882 the extensive emigration to America was organized and directed from Liverpool; and during the year of the Russo-Jewish persecutions 6,274 persons were sent, at a cost which amounted to over £30,000 ($150,000), to the United States and Canada in thirty-one steamships. It is computed that there are at present about 1,500 Jewish families in Liverpool in a total population of about 685,000. Owing to the great influx of Russian and Polish Jews, a number of ḥebras have sprung into existence, as well as two considerable congregations: (1) Bet ha-Midrash, situated in Crown street; (2) the Fountains Road Congregation, situated in the suburb of Kirkdale. A Hebrew school was founded in 1842, commencing with ten pupils. Subsequently a building was erected in Hope place to accommodate eighty pupils; it has since been enlarged so as to provide room for more than 700 children. Among the many Jewish organizations may be mentioned: the Philanthropic Society, Provident Society, Tontine Benefit Society, Board of Guardians, Jewish Shelter, Ladies' Benevolent Charity, Branch of the Anglo-Jewish Association. B. L. Benas, in Proceedings of the Historic Society of Lancashire and Cheshire (1900), vol. xv.